The Jester's Axe: What The Hell Is This??? I got this from a fellow blogger, who sent out a list of new General Officer appointments and promotions that will be happening soon. This leaped out at me right away. 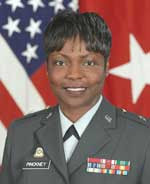 Brigadier General Belinda Pinckney, Commanding General, Family and Morale, Welfare and Recreation Command, Alexandria, Virginia to Director, Army Diversity Task Force, Washington, DC. This did leap off the page at me for a couple reasons. One, we (and by we I mean the US government) are appointing general officers to run an entire command dedicated to Morale, Welfare, and Recreation; and Two, why are we creating task forces for "Army Diversity?" We currently have twice the amount of general officers than we had in WWII. I mention this statistic often, because, even though WWII was a conventional affair, it spanned the world on battlefields from the islands of the South Pacific to the steppes of Russia and the seas of the North Atlantic. We managed to win that war, in all those distant lands, without a general officer in charge of the Post Exchange system, or an M.W.R. Command (which, for you who aren't in the military, is in charge of swimming pools, on base clubs, softball fields, movie theatres, gymnasiums and recreation equipment rental). In a perfect world, it would be great if I was in charge for one day and could just fire all of these unnecessary general officer position. The savings would be awesome, and we could direct those funds to buying more missiles, rockets, bombs, bullets, training, and equipment for our soldiers who are actually killing the enemy. No disrespect to the general, she has worked hard to get to where she is in life. But we need more war fighters and less worries about diversity (which is really perversity). I think the US Army is diverse enough to fight this war, because the last thing I was worried about when I was in my last firefight with the Taliban was inappropriate comments, offensive opinions, or exploitative calenders. We need to stop the "corporate welfare" of the general officer corps; where Congress and the DoD create positions to promote officers into. I think the DFAS, PX and the MWR center would run just fine if it was run by a private company. I don't think we need the equivalent of a CFO ensuring that towels are getting handed out in the gym.